The unpretentious village of Krishnapuram, near Kayamkulam, Kerala, is home to a stunning mural depicting the pastimes of Lord Visnu and the elephant Gajendra. In a small palace located near the old Krishna temple is found one of the largest mural panels in Kerala. The palace was constructed during the reign of King Marthanda Varma, who annexed Kayamkulam to Thiruvithamcode in 1746 AD. The Bhagavata describes Gajendra Moksha as one of the many inconceivable exploits of Lord Vishnu. A great devotee of Vishnu, King Indradyumna, was cursed by the sage Agastya to be reborn as an elephant. The sage's words proved true and Indradyumna was reborn as Gajendra, or the king of elephants. One day, as he stepped into a lake to drink his fill, he was caught by a crocodile. Though he fought with all his might to shake it off, the crocodile only tightened its grip. Gajendra remained thus for many years. Finally in great despair, he cried out piteously to the Lord to help him. Hearing his entreaties, Vishnu descended expeditiously from heaven on the back of Garuda, his celestial transport. "The Second, Third and Fourth Chapters of this canto describe how the Lord, during the reign of the fourth Manu, gave protection to the king of the elephants. As described in this Second Chapter, when the King of the elephants, along with his female elephants, was enjoying in the water, a crocodile suddenly attacked him, and the elephant surrendered to the lotus feet of the Personality of Godhead for protection. In the midst of the ocean of milk, there is a very high and beautiful mountain that has an altitude of ten thousand yojanas, or eighty thousand miles. This mountain is known as Trikuta. In a valley of Trikuta there is a nice garden named Rtumat, which was constructed by Varuna, and in that area there is a very nice lake. Once the chief of the elephants, along with female elephants, went to enjoy bathing in that lake, and they disturbed the inhabitants of the water. Because of this, the chief crocodile in that water, who was very powerful, immediately attacked the elephant's leg. Thus there ensued a great fight between the elephant and the crocodile. This fight continued for one thousand years. Neither the elephant nor the crocodile died, but since they were in the water, the elephant gradually became weak whereas the power of the crocodile increased more and more. Thus the crocodile became more and more encouraged. Then the elephant, being helpless and seeing that there was no other way for his protection, sought shelter at the lotus feet of the Supreme Personality of Godhead." The famous Gajendra Moksha mural in Krishnapuram, which measures fourteen feet by eleven feet, memorializes the pastimes of Visnu and Gajendra. In the mural, Garuda's wings are fanned out in flight as he carries the Lord with great devotion. While Garuda's eyes smoulder with rage at the stubbornness of the crocodile, Vishnu's countenance is filled with mercy and compassion as he puts an end to the suffering of Gajendra, by killing his crocodile attacker. As described in "Murals of Kerala" by M.G. Shashibhooshan, "The mural also depicts several celestial beings including rishis, birds, beasts and goblins of the forest hailing the Lord. 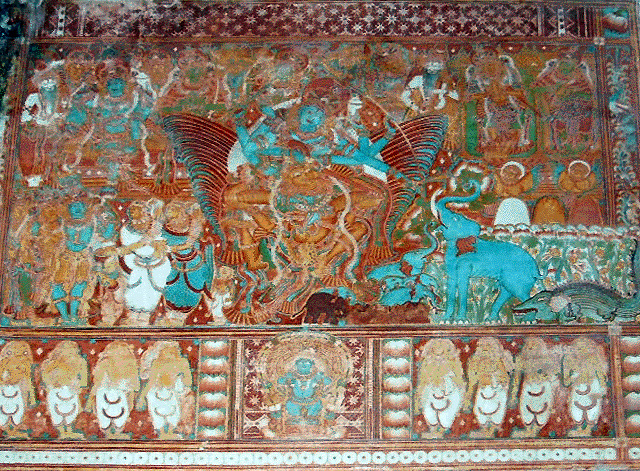 Adjacent to the main subject, on the top right corner of the panel, is a picture of Vishnu seated in Vaikuntha surrounded by celestials. Constrained by lack of space perhaps, the picture of the crocodile lacks conviction. A line of female figures worshipping Balakrishna form a border panel at the bottom. These female figures, like those of the later paintings of Panayannar Kavu, display a post-Vijayanagara or Nayak influence. The lines of this wall painting are comparatively weak. But it is noteworthy for its composition, which seems to incorporate the hallmarks of good art. The painting has linear rhythm, a harmony in the choice of colours, a certain proportion and balance in perspective. But what holds our attention more are the angular convergence of the lines of vision of Vishnu, Gajendra, the crocodile, and Garuda. Among the colours used, ochre, red, and blue-green predominate over white, black, green, and red. Gajendra Moksha was a favourite theme of Indian sculptors and artists. Excellent sculptures on the theme with minor deviations are to be found at Barhhut and Deogarh (Uttar Pradesh) and at the three Pattadakkal temples of Karnataka."